Black phosphorus (BP), with thickness-dependent direct energy bandgaps (0.3–2 eV), shows an enhanced nonlinear optical response at near- and mid-infrared wavelengths. In this paper, we present experimentally multilayer BP flakes coated on microfiber (BCM) as a saturable absorber with a modulation depth of 16% and a saturable intensity of 6.8 MW/cm2. After inserting BCM into an Er-doped fiber ring laser, a stable dual-wavelength Q-switched state with central wavelengths of 1542.4 nm and 1543.2 nm (with wavelength spacing as small as 0.8 nm) is obtained with the aid of two cascaded fiber Bragg gratings as a coarse wavelength selector. Moreover, single-wavelength Q-switched operation at 1542.4 nm or 1543.2 nm is also realized, which can be switched between the two wavelengths flexibly just by adjusting the intracavity birefringence. These results suggest that BP combined with the cascaded fiber gratings can provide a simple and feasible candidate for a multiwavelength fiber laser. Our fiber laser may have potential applications in terahertz generation, laser radar, and so on. U. Keller, “Recent developments in compact ultrafast lasers,” Nature 424, 831–838 (2003). H. Zhang, D. Y. Tang, X. Wu, and L. M. Zhao, “Multi-wavelength dissipative soliton operation of an erbium-doped fiber laser,” Opt. Express 17, 12692–12697 (2009). G. F. Shen, X. M. Zhang, H. Chi, and X. F. Jin, “Microwave/millimeter-wave generation using multi-wavelength photonic crystal fiber Brillouin laser,” Prog. Electromagn. Res. 80, 307–320 (2008). Y. Chen, J. Yin, H. Chen, J. Wang, P. Yan, and S. Ruan, “Single-wavelength and multiwavelength Q-switched fiber laser using Fe3O4 nanoparticles,” IEEE Photon. J. 9, 1501009 (2017). M. Wu, S. Chen, Y. Chen, and Y. Li, “Wavelength switchable graphene Q-switched fiber laser with cascaded fiber Bragg gratings,” Opt. Commun. 368, 81–85 (2016). L. Xia, P. Shum, J. Zhou, and T. H. Cheng, “Eight-wavelength switchable fiber ring laser with ultranarrow wavelength spacing using a quadruple-transmission-band polarization maintaining fiber Bragg grating,” Appl. Phys. B 88, 185–188 (2007). S. P. Reilly, S. W. James, and R. P. Tatam, “Tunable and switchable dual wavelength lasers using optical fiber Bragg grating external cavities,” Electron. Lett. 38, 1033–1034 (2002). S. Pan, C. Lou, and Y. Gao, “Multiwavelength erbium-doped fiber laser based on inhomogeneous loss mechanism by use of a highly nonlinear fiber and a Fabry-Perot filter,” Opt. Express 14, 1113–1118 (2006). Y. Lian, G. Ren, B. Zhu, Y. Gao, W. Jian, W. Ren, and S. Jian, “Switchable multiwavelength fiber laser using erbium-doped twin-core fiber and nonlinear polarization rotation,” Laser Phys. Lett. 14, 055101 (2017). S. Yamashita and K. Hotate, “Multiwavelength erbium-doped fiber laser using intracavity etalon and cooled by liquid nitrogen,” Electron. Lett. 32, 1298–1299 (1996). Y. G. Han, T. V. A. Tran, and S. B. Lee, “Wavelength-spacing tunable multiwavelength erbium-doped fiber laser based on four-wave mixing of dispersion-shifted fiber,” Opt. Lett. 31, 697–699 (2006). Z. Luo, M. Zhou, D. Wu, C. Ye, J. Weng, and J. Dong, “Graphene-induced nonlinear four-wave-mixing and its application to multiwavelength Q-switched rare-earth-doped fiber lasers,” J. Lightwave Technol. 29, 2732–2739 (2011). T. Gu, N. Petrone, J. F. McMillan, A. van der Zande, M. Yu, G. Q. Lo, D. L. Kwong, J. Hone, and C. W. Wong, “Regenerative oscillation and four-wave mixing in graphene optoelectronics,” Nat. 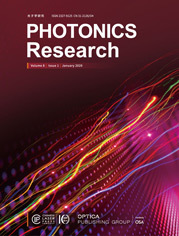 Photonics 6, 554–559 (2012). Z. Sun, T. Hasan, F. Torrisi, D. Popa, G. Privitera, F. Wang, F. Bonaccorso, D. M. Basko, and A. C. Ferrari, “Graphene mode-locked ultrafast laser,” ACS Nano 4, 803–810 (2010). S. Kumar, M. Anija, N. Kamaraju, K. S. Vasu, K. S. Subrahmanyam, A. K. Sood, and C. N. R. Rao, “Femtosecond carrier dynamics and saturable absorption in graphene suspensions,” Appl. Phys. Lett. 95, 191911 (2009). J. Wang, Y. Hernandez, M. Lotya, J. N. Coleman, and W. J. Blau, “Broadband nonlinear optical response of graphene dispersions,” Adv. Mater. 21, 2430–2435 (2009). Q. Bao, H. Zhang, Y. Wang, Z. Ni, Y. Yan, Z. X. Shen, K. P. Loh, and D. Y. Tang, “Atomic-layer graphene as a saturable absorber for ultrafast pulsed lasers,” Adv. Funct. Mater. 19, 3077–3083 (2009). S. Chen, C. Zhao, Y. Li, H. Huang, S. Lu, H. Zhang, and S. Wen, “Broadband optical and microwave nonlinear response in topological insulator,” Opt. Mater. Express 4, 587–596 (2014). S. Chen, Y. Chen, M. Wu, Y. Li, C. Zhao, and S. Wen, “Stable Q-switched erbium-doped fiber laser based on topological insulator covered microfiber,” IEEE Photon. Technol. Lett. 26, 987–990 (2014). Y. Zhao, X. Li, M. Xu, H. Yu, Y. Wu, Z. Wang, X. Hao, and X. Xu, “Dual-wavelength synchronously Q-switched solid-state laser with multi-layered graphene as saturable absorber,” Opt. Express 21, 3516–3522 (2013). N. Zhao, M. Liu, H. Liu, X. W. Zheng, Q. Y. Ning, A. P. Luo, Z. C. Luo, and W. C. Xu, “Dual-wavelength rectangular pulse Yb-doped fiber laser using a microfiber-based graphene saturable absorber,” Opt. Express 22, 10906–10913 (2014). Z. Luo, Y. Huang, J. Wang, H. Cheng, Z. Cai, and C. Ye, “Multiwavelength dissipative-soliton generation in Yb-fiber laser using graphene-deposited fiber-taper,” IEEE Photon. Technol. Lett. 24, 1539–1542 (2012). L. Meng, N. Zhao, H. Liu, X. W. Zheng, A. P. Luo, Z. C. Luo, W. C. Xu, C. J. Zhao, H. Zhang, and S. C. Wen, “Dual-wavelength harmonically mode-locked fiber laser with topological insulator saturable absorber,” IEEE Photon. Technol. Lett. 26, 983–986 (2014). B. Guo, Y. Yao, Y. F. Yang, Y. J. Yuan, R. L. Wang, S. G. Wang, Z. H. Ren, and B. Yan, “Topological insulator: Bi2Se3/polyvinyl alcohol film-assisted multi-wavelength ultrafast erbium-doped fiber laser,” J. Appl. Phys. 117, 063108 (2015). F. Q. Jia, H. Chen, P. Liu, Y. Huang, and Z. Luo, “Nanosecond-pulsed, dual-wavelength passively Q-Switched c-cut Nd:YVO4 laser using a few-layer Bi2Se3 saturable absorber,” IEEE J. Sel. Top. Quantum Electron. 21, 369–374 (2015). H. Zhang, S. Virally, Q. Bao, L. K. Ping, S. Massar, N. Godbout, and P. Kockaert, “Z-scan measurement of the nonlinear refractive index of graphene,” Opt. Lett. 37, 1856–1858 (2012). S. Lu, C. Zhao, Y. Zou, S. Chen, and Y. Chen, “Third order nonlinear optical property of Bi2Se3,” Opt. Express 21, 2072–2082 (2013). F. D. Muhammad, M. Z. Zulkifli, A. A. Latif, S. W. Harun, and H. Ahmad, “Graphene-based saturable absorber for single-longitudinal-mode operation of highly doped erbium-doped fiber laser,” IEEE Photon. J. 4, 467–475 (2012). H. Ahmad, F. D. B. Muhammad, M. Z. Zulkifli, A. A. Latif, and S. W. Harun, “Tunable radio frequency generation using a graphene-based single longitudinal mode fiber laser,” J. Lightwave Technol. 30, 2097–2102 (2012). L. Lu, X. Tang, R. Cao, L. Wu, Z. Li, G. Jing, B. Dong, S. Lu, Y. Li, Y. Xiang, J. Li, D. Fan, and H. Zhang, “Broadband nonlinear optical response in few-layer antimonene and antimonene quantum dots: a promising optical Kerr media with enhanced stability,” Adv. Opt. Mater. 5, 1700301 (2017). T. Low, A. S. Rodin, A. Carvalho, Y. Jiang, H. Wang, F. Xia, and A. H. C. Neto, “Tunable optical properties of multilayer black phosphorus thin films,” Phys. Rev. B 90, 075434 (2014). Y. Xu, W. Wang, Y. Ge, H. Guo, X. Zhang, S. Chen, Y. Deng, Z. Lu, and H. Zhang, “Stabilization of black phosphorous quantum dots in PMMA nanofiber film and broadband nonlinear optics and ultrafast photonics application,” Adv. Funct. Mater. 27, 1702437 (2017). D. Li, H. Jussila, L. Karvonen, G. Ye, H. Lipsanen, X. Chen, and Z. Sun, “Polarization and thickness dependent absorption properties of black phosphorus: new saturable absorber for ultrafast pulse generation,” Sci. Rep. 5, 15899 (2015). J. Zheng, X. Tang, Z. Yang, Z. Liang, Y. Chen, K. Wang, Y. Song, Y. Zhang, J. Ji, Y. Liu, D. Fan, and H. Zhang, “Optical modulation: few-layer phosphorene-decorated microfiber for all-optical thresholding and optical modulation,” Adv. Opt. Mater. 5, 1700026 (2017). J. Zheng, Z. Yang, C. Si, Z. Liang, X. Chen, R. Cao, and M. Zhang, “Black phosphorus based all-optical-signal-processing: towards high performances and enhanced stability,” ACS Photon. 4, 1466–1476 (2017). Y. Chen, S. Chen, J. Liu, Y. Gao, and W. Zhang, “Sub-300 femtosecond soliton tunable fiber laser with all-anomalous dispersion passively mode locked by black phosphorus,” Opt. Express 24, 13316–13324 (2016). S. B. Lu, L. L. Miao, Z. N. Guo, X. Qi, C. J. Zhao, H. Zhang, S. C. Wen, D. Y. Tang, and D. Y. Fan, “Broadband nonlinear optical response in multi-layer black phosphorus: an emerging infrared and mid-infrared optical material,” Opt. Express 23, 11183–11194 (2015). B. Lashkari, S. S. S. Choi, M. E. Khosroshahi, E. Dovlo, and A. Mandelis, “Simultaneous dual-wavelength photoacoustic radar imaging using waveform engineering with mismatched frequency modulated excitation,” Opt. Lett. 40, 1145–1148 (2015). Fig. 1. Optical images of (a) bare microfiber and (b) microfiber coated with BP flakes, (c) experimental setup of the balanced twin-detector measurement device, (d) the measured saturable absorption and its corresponding fitting curve. Fig. 2. Schematic of the BP-based Q-switched fiber ring laser. LD, laser diode; WDM, wavelength division multiplexer; OC, optical coupler; EDF, Er-doped fiber; FBG, fiber Bragg grating; PC, polarization controller. Fig. 3. Dual-wavelength Q-switched operation when the pump power is 95 mW. (a) Output optical spectrum of the dual-wavelength Q-switched fiber laser, (b) typical Q-switched pulse train, (c) single pulse envelope, (d) the RF spectrum. Fig. 4. (a) Average output power and pulse energy versus pump power, (b) the pulse repetition rate and duration versus pump power. Fig. 5. Output spectra of dual-wavelength Q-switched operation taken at a 10 min interval over 1 h.
Fig. 6. Q-switched operation at a wavelength of 1542.4 nm filtered from dual-wavelength output. (a) Output optical spectrum, (b) typical Q-switched pulse train, (c) single pulse envelope, (d) the RF spectrum. Fig. 7. Q-switched operation at a wavelength of 1543.2 nm filtered from dual-wavelength output. (a) Output optical spectrum, (b) typical Q-switched pulse train, (c) single pulse envelope, (d) the RF spectrum. Fig. 8. Dual-wavelength Q-switched operation. (a) The average output power, (b) pulse energy, (c) pulse duration, and (d) repetition rate at the wavelengths 1542.4 nm and 1543.2 nm versus pump power. Fig. 9. Q-switched operation at a single wavelength of 1542.4 nm. (a) Output optical spectrum, (b) typical Q-switched pulse train, (c) single pulse envelope, (d) the RF spectrum. Fig. 10. Q-switched operation at a single wavelength of 1543.2 nm. (a) Output optical spectrum, (b) typical Q-switched pulse train, (c) single pulse envelope, (d) the RF spectrum. Fig. 11. Single-wavelength Q-switched operation. (a) The average output power, (b) pulse energy, (c) pulse duration, and (d) repetition rate at the wavelengths 1542.4 nm and 1543.2 nm versus pump power.